You are here : Home / Aama Vadai / Masala Vada / Recipes / South Indian Recipes / How to make Aama Vadai - Paruppu Vadai? How to make traditional recipes for festive occasions? Festival Special, Aama Vadai also known as Paruppu vadai is a traditional South Indian Tamil snack. It is made with lentils – Channa dhal and Toor dhal and occasionally other lentils such as mung beans, urad dhal can also be added. This is a traditional family recipe. we Indians have one more to go before we take a break. Pongal (aka Makara Sankranti) is the festival of harvest for Indians. A day, in fact in South India, three days, to celebrate and give thanks to nature. So, for the next couple of weeks, you will be seeing a lot of recipes that are made during this festival. I am starting with this traditional crispy fritter Vadai. 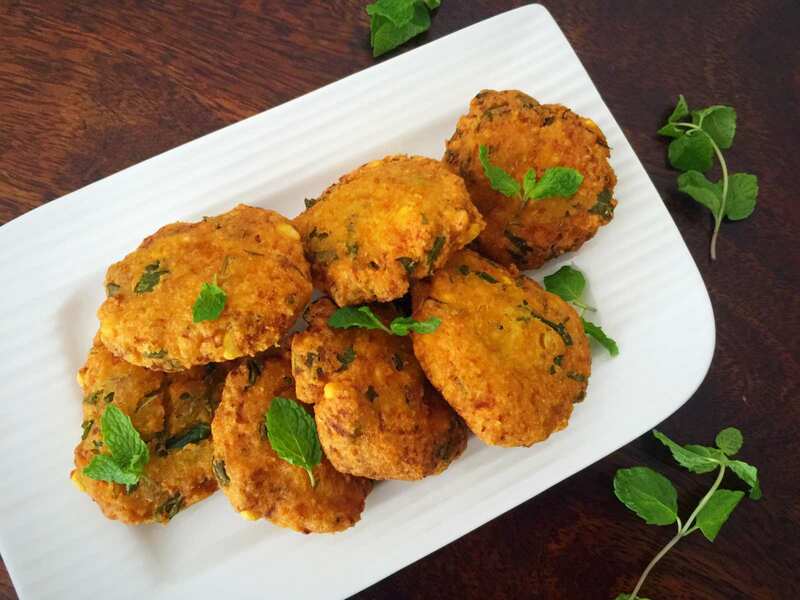 Paruppu vadai as the name implies is made with lentils. Paruppu in Tamil means lentils and hence the name. Vadai is an ancient Tamil food that has been around 100-300 BC. It has been documented in the Sanskrit literature, Manasollasa in the early 12th century. The book – Food And Drinks In Ancient India: From Earliest Times To B.c. 1200 A.d. mentions Vatakas as balls prepared made from different pulses soaked in water and ground on a stone and fried in ghee or oil. Vataka is a name used for something that is round as discs. Through ages, this recipe has changed, adapted and evolved to the present one. Vadai is very famous in Tamil Nadu and it is a major snack item. A variation of vadai – Ulundu vadai is had as a breakfast in accompaniment with the popular south Indian breakfast Idli. We then have keerai vadai, masal vadai, which are consumed as snacks and of course, they are paired with tea. The difference is the type of lentils used in each variety. We also have rasam vadai, sambhar vadai and even thayir (yogurt) vadai, some of which have been there since ancient times. Masal vadai is very similar to aama vadai but with loads of onions. While preparing food for religious occasions, we avoid using onions. So aama vadai is plain and simply devoid of flavour booster ingredients like onion or garlic or even fennel seeds. Apart from this, I would like to point out a major difference between the masal vadai and this aama vadai. The main ingredient for both the recipe is channa dhal. The main difference is that aama vadai is thicker and soft whereas the masal vadai is very thin and crispier. Thus making it more appetizing as a snack. 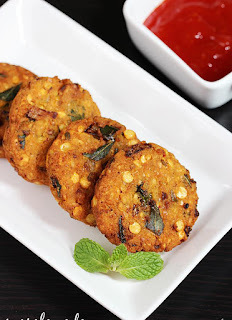 Aama vadai is quite simple to make and has no complicated procedure or rare ingredients. If your pantry is stocked with the basic Indian ingredients you are set to go. If you are a fan of falafel, I bet this will become your favourite too! 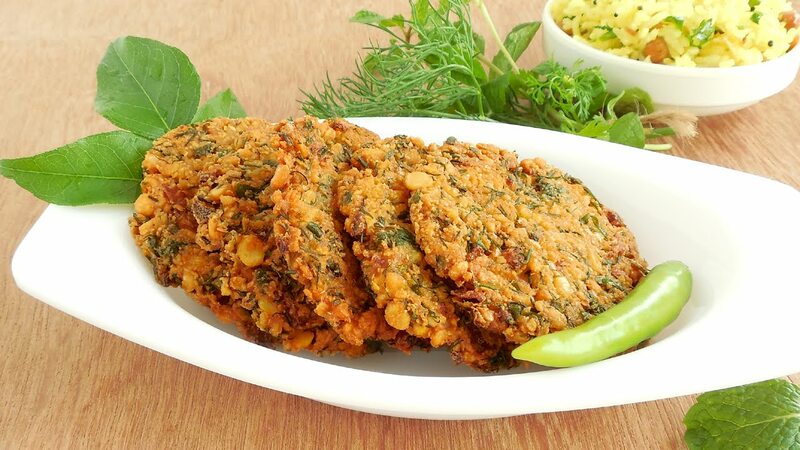 Crispy fritters made with three different lentils. This is a must during most of the Tamil Hindu festivals. 1.Soak all three lentils in water for about 2 hours; at least one hour. 2.Drain the water completely. Add the dhal, red and green chillies, curry leaves, salt, and asafoetida. Pulse this mixture in a mixer 3- 4 times. It should be a coarse paste. It is okay if one or twolentils remain whole. 3.Check for salt and adjust. Divide it into 11-12 balls.Meanwhile, add oil in a kadai for deep frying. Once it is hot, keep in medium flame. 4.Shape each ball into small discs like a patty, slightly less than 1/2 inch thickness. 5.Deep fry in a medium-high flame until it is golden brown on both sides. You can add more than two in a pan taking care not to overcrowd the pan. Leave enough space for the vadai to cook completely. 1.Grind the lentils coarsely. It is okay of some lentils remain as such. Do not add water unless it is difficult to grind. Sprinkle some if necessary. 2.You can also reserve a tablespoon of soaked lentils and add to the ground mixture. They give a nice texture and bite. 3.You can also grind the mixture ahead and store them in the refrigerator. This helps in achieving even crispier vada. This is also a troubleshooting tip if the mixture becomes too moist or watery. Also, try adding rice flour to absorb the excess moisture. 4.The green chillies in the recipe are the Indian variety. The best substitute for Indian chilly is the Thai chilly variety that is available in most supermarkets. 5.The total amount of dhal is 1 cup for this recipe. If you are not using urad dhal, then use 1/4 cup toor dhal and 3/4 cup channa dhal. Make sure the channa dhal is more in proportion. The amount can be adjusted a little bit. 6.Do not crowd the pan while frying. Otherwise, it will not turn crispy and may be undercooked.